This radio has a fashionable appearance, simple and easy-to-use functions, high-end decoding and radio IC, 45mm high-fidelity speaker, clear and loud sound, strong ability to received signals to bring you a pleasant experience. 1. It supports the playing of music in MP3 format saved in micro SD card and USB disk. 2. It supports FM and AM 2 band reception. 3. The entry into TF card or USB disk for playing shall be referred to as MP3 playing mode and the entry into FM or AM radio reception Mode. 4. After it is enabled, it was firstly scan whether there is any storage device inserted(micro SD card or Disk), if any storage device is deleted, it will automatically enter MP3 playing mode. If not, it will enter Radio Reception Mode. The storage device inserted into it shall contain audio MP3 format. Otherwise, it will not recognize and ignore the storage device. 5. The radio has a memory function. The searched and locked program will be stored automatically and serial numbers will be generated in sequence. Pls don't hesitate to contact us via Amazon Message if any problem with headset or email us at geson_support@163.com, we will reply you asap. Multifunction Radio: AM Radio + FM Radio + MP3 Music Player + Computer USB Speaker 4 in 1 radio player. FM Frequency is 76-108MHz. AM frequency is 522-1710MHz. High Quality Sound and Stable Signal: This dual band radio with a high-end decoder IC and 45mm high fidelity speaker make the sound clear and loud, strong ability to receive signals to bring you a pleasant experience. 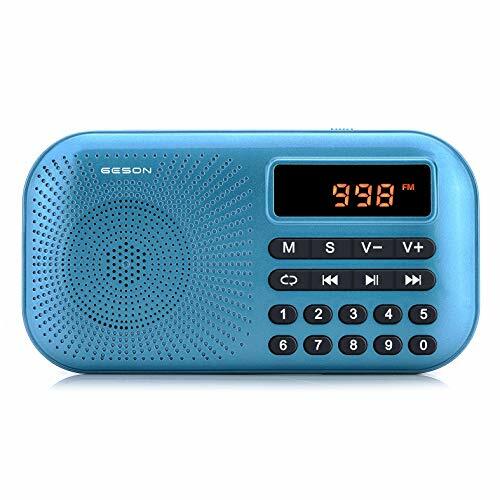 Mini and Portable Radio Player: The mini portable digital radio has fashionable appearance with UV Technology and pocket-sized (4.76*2.54*1.2 inches). It is simple and easy-to-use. Suitable for drive-in, camping, walk, listening to football and baseball games. Best gift for elder, students and kids. Rechargeable and Removable Li-ion Battery：Equipped with a BL-5C, 1000mAh lithium battery, it can play about 6 hours after full charge. Memory Function: The radio Player supports 32GB micro TF Card / USB Disk and has a memory function. It will automatically memorize the song and the radio station played last time. The searched and locked program will be stored automatically and serial numbers will be generated in sequence. If you have any questions about this product by Geson, contact us by completing and submitting the form below. If you are looking for a specif part number, please include it with your message.